We are having another beautiful day today. The sun is out. The temperature is in the 60's and no wind...Love it. 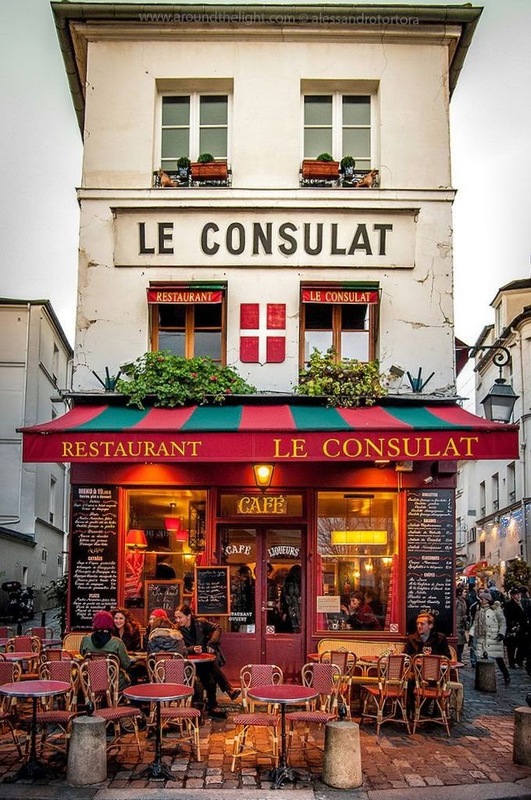 I'm dreaming again about how wonderful it would be to travel to Paris and sit at a little table watching the people walk by as I drink a cup of coffee and dip a croissant into a dish of chocolate. I don't have a trip planned anytime soon, but I thought I would pretend. Yes, I'm pretending again. I made some pudding and baked some croissants and now I want you to enjoy a cup of coffee and dip your croissant into the chocolate. Please help yourself. I found these darling dessert plates at TJ Maxx last summer and I knew I would be setting this table. The sun shines into my dining room and I can sit and have a cup of coffee in the morning and tea in the afternoon. I have camellia bushes in the front yard. This pink double "Debutante" is loaded with blooms and in my 'Friendly Village' post HERE I had a bouquet of "Yule Tide" camellias. And I love the look of this cafe. So french!!! Well, my dream has come to an end. I do have some inspiration and I'm grateful I can enjoy my French Cafe right here at home. 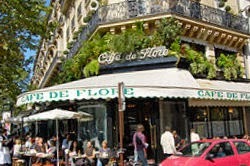 I actually had lunch at the cafe that you have photographed, Cafe De Flore and people watched. Nothing is better than that in Paris! I miss the beautiful croissants and baquettes. It is all so pretty ,I going to sit and watch people and drink a cup of coffee at Cadiz Spain in about a month. Life would be very dull if we could not pretend and dream. The croissants look yummy and dipping it in a choc sounds more delightful. When I was in America we were supposed to go to T J Maxx but we missed out on the opportunity, I like the plate though. What a delightful tea (coffee) party. Your croissants look dangerously delicious! Thank you for sharing with us. Lucky you to have pretty Camelias! And I too enjoyed your Paris cafe dream. Lovely! Wishing I had one of those tasty croissants right now. Love your cute plates. What a wonderful dream. The cafe looks like a great place to people watch.. 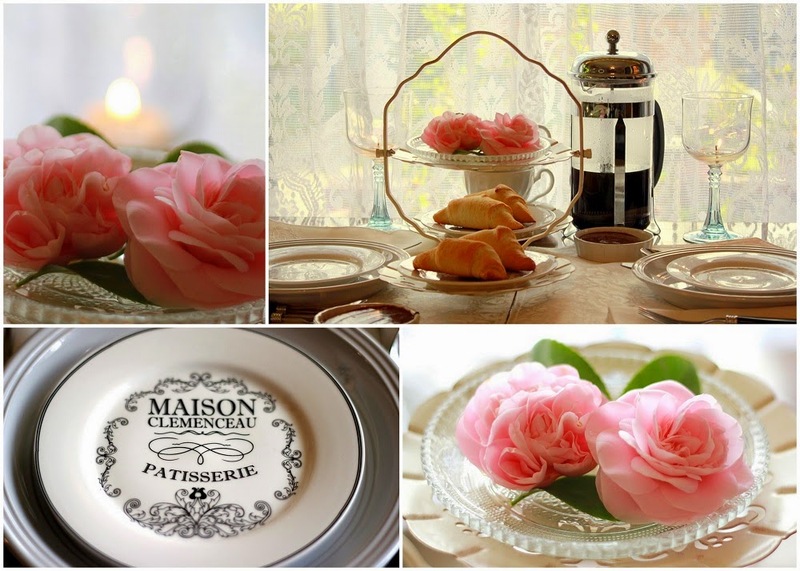 The croissants and chocolate look yummy.. And you camellias are lovely..Lovely images. Have a happy week! I have enjoyed your post today. Such a pretty table setting. Love your flowers and sitting by the window. The food looks scrumptious. I don't mind pretending a tea in Paris with flaky croissants, chocolate for dipping and fresh hot coffee. The pink camellia blooms are pretty. You whisked me to Paris with your beautiful photos and I could imagine the wonderful smells of your baking as well! Wow, someday, in my dreams, I would love to visit that cafe too... So pretty.... Those flowers on your tea table are so delicately pretty as well. I could just imagine the bliss I feel sitting on that table enjoying your tea :-) Love your post!!! I enjoyed coming along with your dreams ~ lovely tea time! I don't mind at all pretending to be in France. My son has been there three times and he told me that dining outside at one of their sidewalk cafes is truly an experience that everyone should be able to enjoy. He loves French food too. What a lovely tea time and your camellias are gorgeous! What a beautiful colour! I so enjoyed your posting and thank you for sharing it with us. I would love some French press coffee and pudding...lovely table setting. If we can't go to Paris in real life, the next best thing is a pretend party. Love the colours, your plates, and those yummy looking croissants. You did create a French tea time here so well! I enjoyed it all and the lovely pictures! I loved this! I feel as if I've just been to Paris! Your pink camellias are beyond stunning!! Chocolate and croissants are the perfect combo! I would LOVE to visit that little cafe! This is my first time to visit, came over from Marty's. Love your pretend cafe, and croissants and chocolate sound divine. Croissants and cafe, and beautiful flowers, can't beat that! Loved your dessert plates, I love french things like that too, they are so cute. Thanks for sharing your fun cafe with us. I really enjoyed your tea in Paris. I can just picture sitting at one of those cafes. This is beautiful! Thanks for linking up with Home Sweet Home! Whether in our imagination or the "flesh" joy and beauty is always in style! Love your lovely trip! Back from break with a feeling-better-Honey! Beautiful, and your photos are amazing. Just lovely! Saw you featured in Amaze me Monday! BTW, I have a similar 2 -tiered tray you used, do you know what it's called? thanks! Such a lovely tea time! We have had some nice warm temps and snow is coming our way! I love the Colorado weather we get! It is potluck! I am catching up from Pink Saturday and enjoyed your post very much. Come visit me soon and have a wonderful week.